Wildfires have long ravaged the huge 5th Supervisorial District in Los Angeles County, but outgoing Republican Supervisor Mike Antonovich, who has represented the district for 36 years, just got around to recommending that the county lease super scoopers year-round to help fight the dangerous blazes. According to KABC News, Antonovich wants to "take another look at the contract" with Canada for the water-tossing aircraft. Hmm, I wonder if that has anything to do with the fact that Antonovich is now running for the State Senate? For almost four decades, he's been a consistently right-wing reactionary on the powerful Board of Supervisors. But because he's being ousted from that job by term limits, he's now trying to win a seat in the the predominantly Democratic 25th state Senate district. That puts Antonovich in a dilemma. How do you hide the fact that you're a Republican? First, he puts up campaign signs that don't mention that inconvenient fact. Second, he sends out mailers that also ignore his many years as a Republican leader, including a stint as the Chair of the state Republican Party. Third, he doesn't play up the fact that he's been opposed to almost every liberal cause, including raising the minimum wage, protecting the environment, gay rights and abortion. Nor, understandably, does he mention his decades-long immigrant-bashing and intolerance to other ethnic communities, including inflammatory rhetoric immediately after the San Bernardino tragedy that comes right from the Donald Trump playbook. Finally, he's desperately looking for last-minute issues that appeal to Democrats and Republicans alike. And in the wake of the current devastating fire in the Santa Clarita Valley an hour from downtown Los Angeles - which has left one person dead, charred more than 33,000 acres, forced the evaluation of 10,000 homes and 200 commercial structures, destroyed at least 18 buildings, and spread smoke and dust to almost every corner of this huge, 4000 square mile county with over 10 million residents - you come up with a plan to get the County to rent super scooper aircraft to bolster the County Fire Department's effort on a year round basis. Since 2011, the County Fire Department has leased a heli-tanker and two Canadian super scoopers that can dump about 2,000 gallons of water in 12 seconds. They've been used to douse wildfires with aircraft-carried water. But they aren't employed year round. Instead, the County leases them only after Canada's fire season, which doesn't end until next month. When the Santa Clarity Valley fire erupted last week, the County Fire Department did not have the supper scoopers at their disposal. The Canadian super scoopers aren't set to arrive until next month, according to the Los Angeles Times. The same was true for the Station Fire, the most devastating fire in history. That fire raged with the super scoopers still in Canada and not available to help. And now, Antonovich is launching into the same PR story he did back then, grandstanding and stating the obvious. "We're now finding that fire season is not just a particular time of the year," Antonovich told the Times. "It's basically all year." How long did it take Antonovich to figure THAT out? 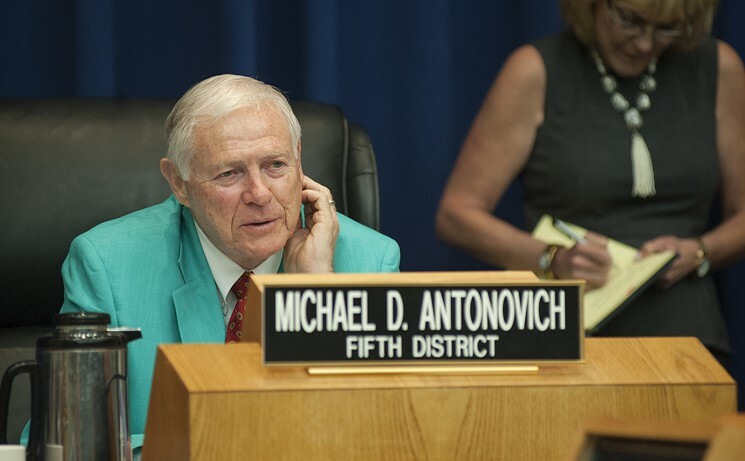 The 76-year old Antonovich has been an elected official since 1969. He's served on the Board of Supervisors since 1980. His 5th district includes northern LA County, including Antelope Valley, Santa Clarita, Pasadena, and parts of the San Fernando and San Gabriel Valleys. All of these areas are prone to wildfires. When the County first leased the super scoopers five years ago, Antonovich was a big cheerleader. But only now - when he's in a desperate race for a state Senate seat with Democrat Anthony Portantino and doing anything to get attention - has Antonovich decided that having the proper fight-fighting equipment year-round is a good idea. Some folks might call Antonovich's penchant for "post-tragedy" proposals political grand-standing. But for the Santa Clarita Valley families who are now facing massive damage from a fire that so far is only 10% under control, Antonovich's better-late-than-never act could be very costly. The point isn't to add to their pain or to say year-round super scoopers are a bad idea. But it is important to recognize that, after many costly disasters, Antonovich's big idea comes a bit late in his political career. This isn't the kind of leadership our communities demand and deserve. Peter Dreier is professor of politics and chair of the Urban & Environmental Policy Department at Occidental College. His most recent book is The 100 Greatest Americans of the 20th Century: A Social Justice Hall of Fame.